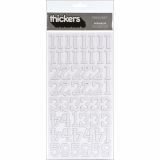 Thickers Chipboard Glitter Stickers 6"X11" Sheets 2/Pkg - AMERICAN CRAFTS-Thickers Glitter Stickers. Add sparkle and dimension to your paper crafts with Thickers Chipboard Glitter Stickers. This package contains two 11x5-1/2 inch sheets of acid free, archival quality stickers. Available in a variety of colors and fonts: each sold separately. Imported. Chipboard Letters. Available in a variety of colors and fonts: each sold separately. Imported.